On Monday officials from the Silesian Voivodeship met with representatives of Pfeifer Seil un Hebetechnik to sign the contract for Stadion Śląski’s roof. The deal worth PLN 84 million (€20m / $26m) will see Pfeifer examine the steel cables of future roof and pick up from where construction was halted in 2011. German contractors, who are famous for their roof structures, are expected to enter the construction site next week. The entire process of reconfiguring, lifting and covering the cable roof should last 420 days. However, should any of the cables on site be damaged, the contractor will receive extra 120 days. Authorities initially hoped to land a contract at around 70 million but Pfeifer, who were the only company interested, assessed the risk of this project higher than usually. 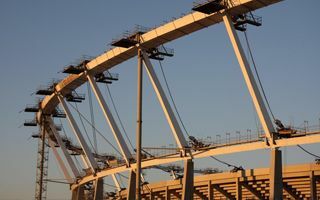 Complications with this stadium’s construction date back to July 2011, when the cable roof structure snapped during its “big lift” operation. This was the first accident of its kind, blamed at GMP Architekten, whose design proved weaker than expected. The stadium is expected to cost nearly 600 million zloty (€140m / $180m) when done in late 2016. It was initially hoped to be ready for Euro 2012 and with 55,200 seats it will be Poland's second largest stadium.